We are proud to launch our Table Setting of the Week project. 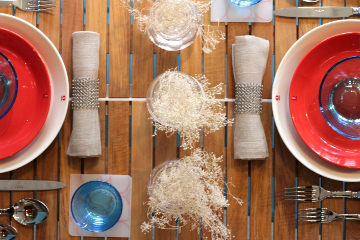 Each week, Didriks will present a table setting idea to spruce up any dinner table. Why are we doing this? We've listened to our customers and realized that trying to visualize the individual items on our online store put together in an actual place setting can be challenging. One of the great values we offer when you visit our store is that you can see many examples of how the items work together to create a great table setting. So, to make visualizing easier, we will be putting together a new table setting every week so that you, our customers, can get a better sense of color coordination, size, and the overall look that you can expect to achieve in your own homes. As the saying goes, seeing is believing. Our first table setting is inspired by the upcoming Independence Day. The look is simple and contemporary with colors inspired by the red, white, and blue of the Amerian flag. The colors are echoed in the Iittala Teema dinner plate in white, the Iittala Teema salad plate in terracota, and the Iittala Kartio bowl and Iittala Kartio tumbler and the Sabre Natura five piece flatware set all in light blue. The finishing touches: three extra-mini Simon Pearce Shelburne Vases make an unintrusive and simple table center piece that can be filled with your favorite seasonal blooms; Libeco Fjord Linen Napkin in flax held by Chilewich Raymaille napkin rings; and the fun and modern Modern Twist Coaster Notz in pebbles red/brown. Whatever your plans for the long 4th of July weekend, we hope that you get a chance to sit down for a meal with the people you love and toast the 235th birthday of USA.